What Time of Year Do Lemon Trees Bear Fruit? Lemons are an acid citrus fruit. Available in many varieties, lemon trees grow in temperate zones. The time of year lemon trees bear fruit depends on the variety and climate. 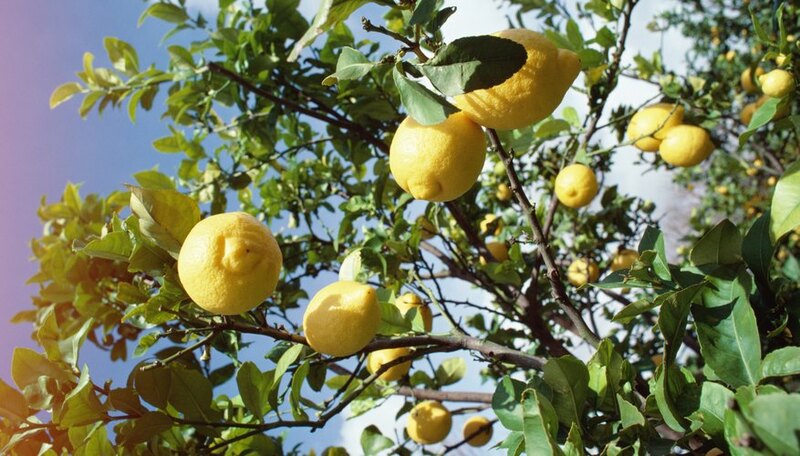 In mild climates, some lemon trees may bear fruit any time of year. Lemons ripen on the tree and at maturity typically change color from green to yellow. According to Texas A & M University, the true lemon species apparently originated in India centuries ago. Two primary types of true lemons are the Eureka, developed in California, and the Lisbon, developed in Australia. Other lemon types are not descended from true lemons, but look or taste like lemons. These types, such as Ponderosa and Meyer, are used like lemons. Eureka lemon trees bear fruit from spring to early summer. These warm season lemons are small and sensitive to cold. Lisbon lemon trees bear fruit from summer to fall. Medium in size, this fruit is more cold tolerant and has more fruit seeds than the Eureka. Ponderosa lemon trees with a large and seedy fruit, and Meyer lemon trees with fruit shaped like an orange, are cold tolerant and bear fruit from fall to winter. These fruits are larger than true lemons and have thicker rinds. Phyllis Benson is a professional writer and creative artist. Her 25-year background includes work as an editor, syndicated reporter and feature writer for publications including "Journal Plus," "McClatchy Newspapers" and "Sacramento Union." Benson earned her Bachelor of Science degree at California Polytechnic University.